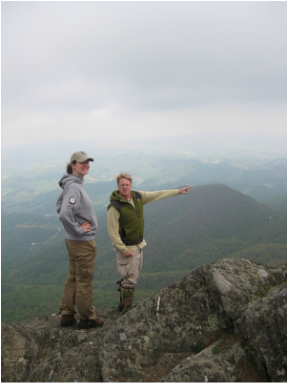 Lesley Starke and Rob Evans looking across North Carolina from the rock outcrop at Tater Hill. 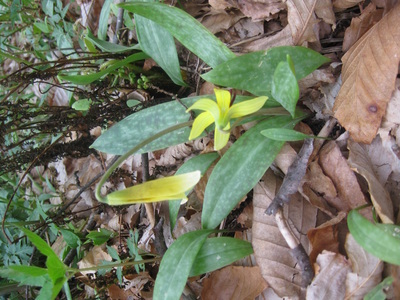 The N.C. Department of Agriculture and Consumer Services finalized purchase of the initial 158 acres tract of Tater Hill in Watauga County, with the purpose of protecting the endangered plant species native to the area, in 2000. 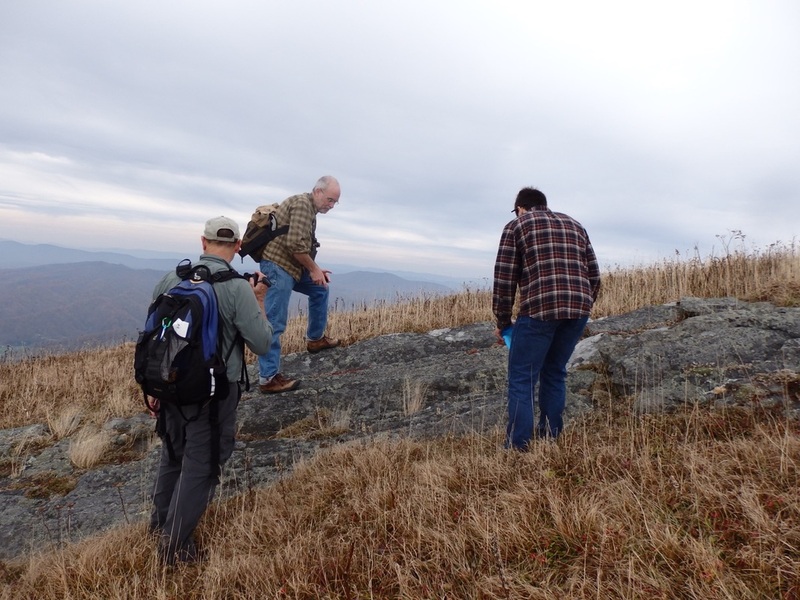 Matt Estep, professor at ASU and volunteer Tater Hill Steward, leads a field trip to explore the area. No one ever makes any apology for calling this striking mountain peak by its real name- Tater Hill. For it was never a potato hill, potatoes being mere ornaments for the skill of French chefs. Taters are what we were "raised" on, while city children were "reared" on potatoes. The first man to see the charm of this lonely spot was one Chapley Wellburn. He entered it in April, 1799, four hundred acres of it, and lived there, probably hunting for a living, the people who live on lower levels being the only ones who indulge in the pas-time of earning a "livelihood." Well, he thought he had a title to that land, and in 1876 J. B. Todd, by order of the court, con-veyed this title to one of his descendants in Wilkes (Deed Book R, p. 108). But Alfred Adams knew a thing or two, one of them being that adverse possession under color of title would "ripen" that title into an "indefeasible estate of inheritance," or words to that general effect. So he got the very best "color" "the air," to wit, a grant from the sovereign State of North Carolina - not from Sovereign Linn, who was living in this county at that time. Adams occupied about three hundred acres of his grant, and when he locked horns with H. M. and W. N. G. Wellburn, through his grantee, John H. Bingham, about the year 1902, over the entire four hundred acres and other lands also, he won three hundred of them handily. (See Minute Docket E, p. 154, Clerk's Office.) It developed in the trial of that suit that one Flannery, meaning not necessarily that he had no family, but that he might have been almost any Flannery, claimed the land in the flatwoods tinder Tater Hill, but left about 1849, after which a man named James, but whether John James or James John is not known, came and brought a pack of hounds with him. Hounds have to eat. So do wolves. In the duel to see which should eat the other, the wolves won. James thought his turn might come next, either to eat or to b.e eaten, so he returned to Alexander County, whence he had come, which, sad as that fate might be, was better than furnishing the funeral baked meat for a lupine holiday. Then, about 1902, came the late Romulus Z. Linney, who, remembering that his old namesake had been "fetched up" by wolves, boldly entered on this demesne and re-tained possession till his demise, demesne and demise having different meanings. But he built a rock wing to his four-room dwelling, which still stands and in which he spent many happy days. This is the gentleman who, before he had tasted of the delights of the Tater Hill, was offered a high office in Washington, D. C. In declining it, he said that he would not give up his spring rambles in the Brushy Mountains of Wilkes for any office within the gift of the American people. But he gave them up for Tater Hill! Reports have come in about poaching on Tater Hill, with evidence of Houstonia montana, Roan Mountain bluet (Endangered), being dug up and taken. 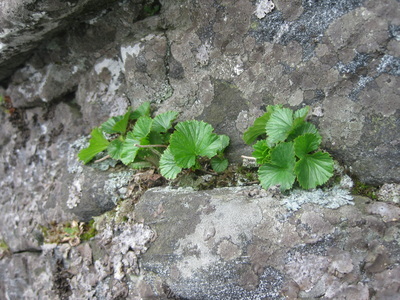 These are small plants, and not many of them if any are left because of poaching. 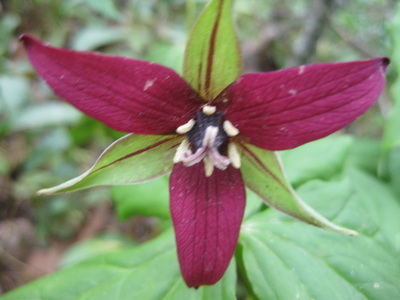 To those interested in the survival of the species the loss of these plants is devastating and pushes the species closer to complete loss in North Carolina. Friends and neighbors are now watching the area for us. YOU CAN HELP: Join Friends of Plant Conservation and indicate your interest in conservation activities. 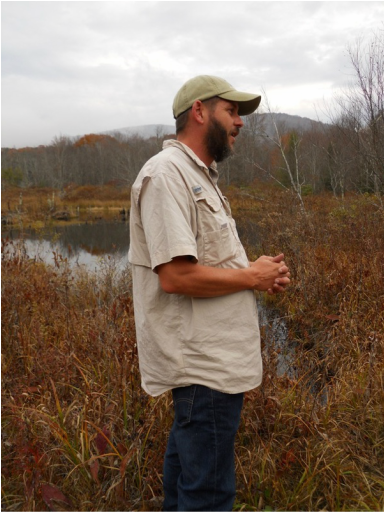 With help from our friends at Blue Ridge Conservancy an area that contains a small wetland has been added to Tater Hill. Watch our Field Trips page for an opportunity to visit this new site. We will try to have something lined up in late Fall 2016 or early Spring 2017.